A trending container for many types of arrangements! Our rectangular wooden box has been filled with a base of winter greenery: cedar, pine, and douglas fir. 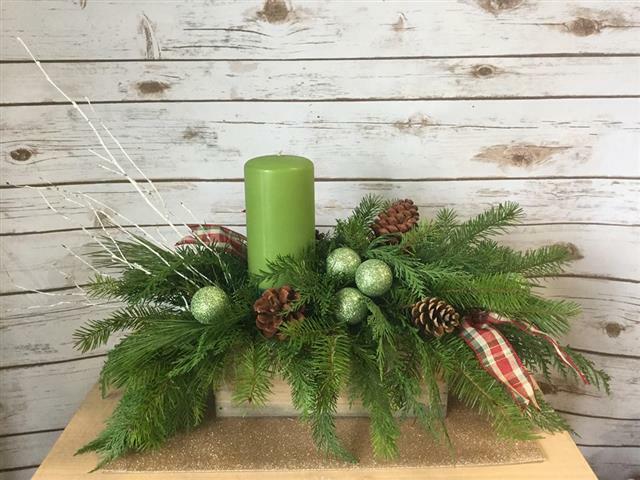 A 3" green pillar candle is off centered to create a modern Christmas centerpiece look. White Birch Branches are inserted and sprayed out the left side of the arrangement to reinforce the modern look. No holiday centerpiece is complete without a little sparkle. Green glittery accent balls are spread throughout the design. Lastly, to bring in a little country we have incorporated some pine cones and a couple of ribbon tucks with a country pattern. A perfect centerpiece all on its own or read further about our upgrade options with flowers!